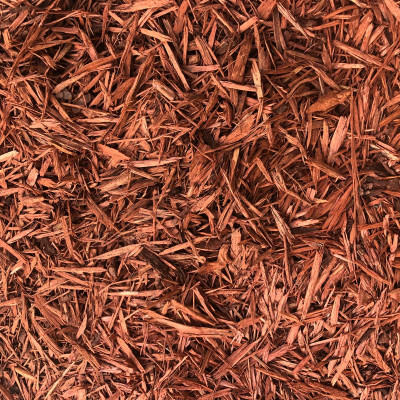 Mulch Red Bark provides a decorative vibrant looking mulch finish for beds. Organically coloured which means its safe to use on all areas in the garden. Mulch Red Bark is made from native Irish softwood and has been carefully dyed with organic earthly materials to provide its striking colour. Apply 50mm to 70mm depth on flat or sheltered areas and up to 100mm on uneven or exposed locations. Do not use a weed control membrane. The bark requires moisture from the bed to prevent it from drying out and blowing away. Prior to application apply organic weed killer or remove any weeds from the soil. Replenish bark annually to maintain the decorative natural looking finished for effective weed suppression. A 1m3 bag of bark spread 50-70mm thick covers 15m2 to 22m2 depending on how densely planted the bed is.